Whole grains fruits aciclovir cost and vegetables would supply your body dietary.. 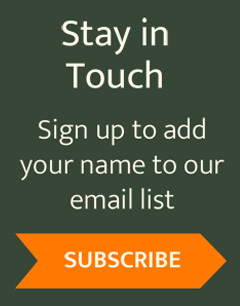 If you haven’t heard of “Altai Hok,” you are not alone. What is an “Altai Hok” and its origin? 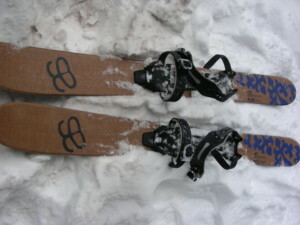 According to the website, the skis were inspired by backcountry skiers of the Altai Mountains in North Asia where Altais were born (www.altaiskis.com). The best way I can describe the Altai Hoks is they are a hybrid ski that brilliantly combines maneuverability of a snow shoe with gliding qualities of a cross country ski. It is a short, wide backcountry ski and, importantly, incorporates a skin, mid-section of the base (see pictures below) which grips when going uphill, yet provides minimal drag on glide. The ski has metal edges improving control. The base requires little or no waxing. First, the binding does not require a specific boot, no expensive specialized boots needed. Second, it adjusts widely for most boot sizes. 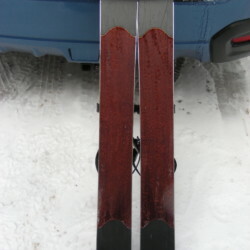 Third, the skis come in two sizes (125 and 145 cm), the shorter fitting almost everyone. Fourth, binding has ratchets on toe and ankle straps making on and off very quick. Fifth, generally the Hoks are fine as is, or if icing occurs, use silicone spray or Swix F4. Finally, the skins can be replaced, if necessary, or user repaired (see website). I tested them in January 2017 under icy conditions, packed powder and fresh power, 4” to 6”, on three terrains. First, a fairly flat trail, ideal for beginners; second, a hill steep enough to require the herringbone technique (beginner to intermediate skiers); and third, a typical backcountry trail with varied terrain (intermediate to advanced skiers). 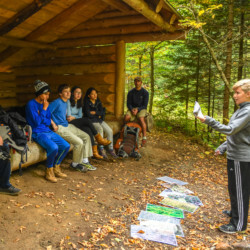 These areas were selected as all are readily accessible to ADK’s Heart Lake Loj; first, Mr. Van Trail to Easyside Trail; second, ADK Ski Slope (Heart Lake); and third, Van Hoevenberg Trail to Fangorn Forest Trail to Old Marcy Dam Trail. While conditions were icy, 4”-6” of new snow had fallen. This terrain is flat with wide trails, ideal for beginners. No one had used the trails, the Hoks glided effortlessly through the snow. Due to ski width, they easily broke the trail despite snow depth. A strong point under these conditions: the Hoks are very stable and easily broke fresh powder with little effort. This area was tried under packed powder and 4”-6” new snow. My major objective was to assess the Hoks climbing ability. My prior experience, with cross country skis, was herringbone required the second half of the hill. To much effort to get to top, for the ride down. With the Hoks, I was surprised that under packed powder or new snow, I could go ~95% up the hill with comparatively little effort. On the ride down the skins provided slower but far more controlled descent than on cross-countries. Even in unbroken powder it was fairly easy to approximate parallel skiing, making wide turns. Overall, there was a high level of control in direction and speed with far more fun than cross country skis. 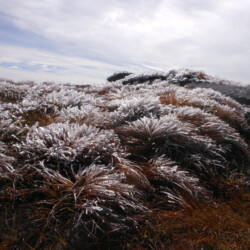 These trails provided variety and challenge to see how the Hoks handled. The conditions were similar, 4” to 6” of new snow. The first section was packed, with modest hills and dips. The Hoks handled the terrain well, providing ample grip, no herringbone needed. Upon reaching Fangorn Forest Trail, the conditions were different as the trail was unbroken powder. Also, difficulty level was increasing, confirmed by large “Caution” sign. This trail was clearly beyond beginner level, prime terrain to test the Hoks. Conditions here were much more challenging. There were some fallen trees requiring off trail travel for short distances. Yet, the short and wide Hoks were well suited to maneuvering off trail and crossing areas of runoff. Overall, the Hoks readily handled the snow and trail conditions. At no point, did I wish I had snowshoes. The Fangorn Forest spur was challenging but proved the Hoks versatility. Once arriving at Old Marcy Dam trail, the remaining section was an easy and quick return to the Loj, far faster and more fun than snowshoes would ever be. Like any ski, they perform poorly on ice and are not designed for steep, rocky climbs, conditions requiring snowshoes. The skis are not designed for rocks, gravel or sand. Bare spots and gravel areas require care. The website recommends field repairs using super glue. The skis exceeded all expectations in the snow and trail conditions tested. Their width and length make them stable yet highly maneuverable. The skins provide substantial climbing ability greatly reducing uphill effort. Considering performance, convenience, and compatibility with a wide range of winter footwear, the Hoks provide great value for individuals and families alike. Downhill and cross country equipment, for different genders and growing families, is very expensive due to differing foot sizes, heights and weights, often requiring new boots and longer skis. The Hoks, with their adjustable bindings and standard ski length, effectively break the periodic replacement cycle required with downhill and cross country equipment. This combination of benefits, and fun factor, should make the Hoks a big success, as awareness and availability grows. Finally, they are highly useful for various trail options in immediate proximity to the Loj, as shown on “Heart Lake Property Map”. The cost incurred in December 2016 for the 125 cm Hoks, with factory bindings, was ~$270, including tax with free shipping, making this a sound value for individuals, seniors, and families alike. Christopher Corbett is a member of the Heart Lake Property Committee and author of two articles on renewable energy entitled:”Should I Go Solar” that provides a buying guide and “Owning a solar system” which reports his first year of operation. They are published on ADK’s website and can be located by searching on “solar”.